The evocative historical parade was followed by a long and complicated “mossa“, the time where the jockeys and horses are supposed to take their alloted order so that the race can be run. Over an hour later and after 3 false starts, the start of the race was finally decided by the setting sun rather than by the “mossiere“, the figure responsible for deciding that the alignment of the horses was mostly respected and thus the start and race valid. The Civetta or Owl contrada won the race after a 30 year dry spell. No other contrada had waited so long for such a sweet victory. One could say that nature just took its course: running after sunset helped the nocturnal creature as it entered the race at its prime time for activity. 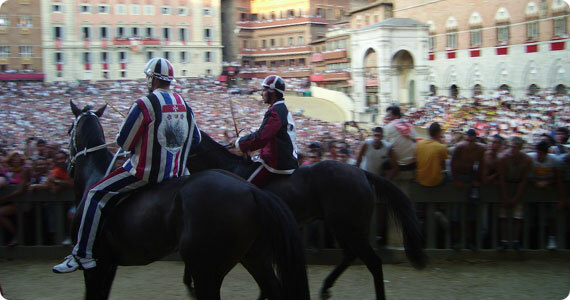 The contrada, known as the “prior” district for having hosted the priors of the districts during a time of conflict with city hall in 1887, was also able to secure victory thanks to the ability of its jockey in taking the spot assigned to the Unicorn, its great rival, and then in masterly handling the experienced horse it had received through lottery. Lots of cheer and celebration continues to take place in this small district, while the Porcupine district smiles at the fact that their rival, the Wolf, now has the honor of wearing the “cuffia”, or grandmother’s bonnet, symbol of the unhappy distinction of going the longest time without wins. The Wave flipped out at the mossiere for allowing the start of race to be valid while their horse was turned in the opposite direction and now gnaws over its misfortune and the teasing of all its adversaries. It is best to gloss over the talk of the Sienese over the mossiere’s actions. The nicest comment (maybe the only one that can be mentioned) is that he whispered to the horses instead of shouting and calling the jockeys into order. The mossiere seems to hold too little power and for the last few races seems to not have any control over the behavior of the jockeys. In the interest of the Palio, some procedures should be adopted to counteract their behaviors, such as hitting them with economic fines or excluding them from the next race. Even if Sienese might consider this a blasphemy (for which we excuse ourselves beforehand), we propose the drastic idea of penalizing misbehaving contrade by making them start the race from the second row – where the Wave found itself just the other day but facing the right way. This might just prove to be the right deterrent to the jockeys that keep ignoring the calls of the mossiere. In the meantime, there is talk in Siena of celebrating in using the two Palios of 2010 to celebrate the 750th anniversary of their victory at the Battle of Monteaperti over the Florentines. Sienese can certainly gloat over a victory for a very long time. We’d like to bet that the drappellone or prize for the Palio will certainly not be painted by an artist from the city of the Lily as it was this past edition. What can we say, Siena is Siena, it might surprise you but it makes itself be loved. As the beautiful Palio song used during the Rai live TV stream says, come visit us and “you’ll fall in love with this land of the color of rust”.